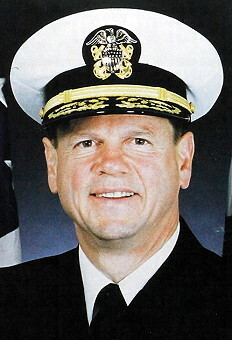 Rear Admiral, USN, Ret. ; U.S. Naval Academy; U.S. Naval Test Pilot School; Naval War College; Navy Nuclear Propulsion School; John F. Kennedy School of Government, Harvard University; at the time of his selection assigned at NAS Oceana, Virginia Beach, Virginia; semi finalist in NASA astronaut group 8 selection; Commanding Officer USS Nimitz September 16, 1989 - April 16, 1992; serves as the President of The Severn Group, LLC in Annapolis, Maryland. Last update on May 27, 2018.